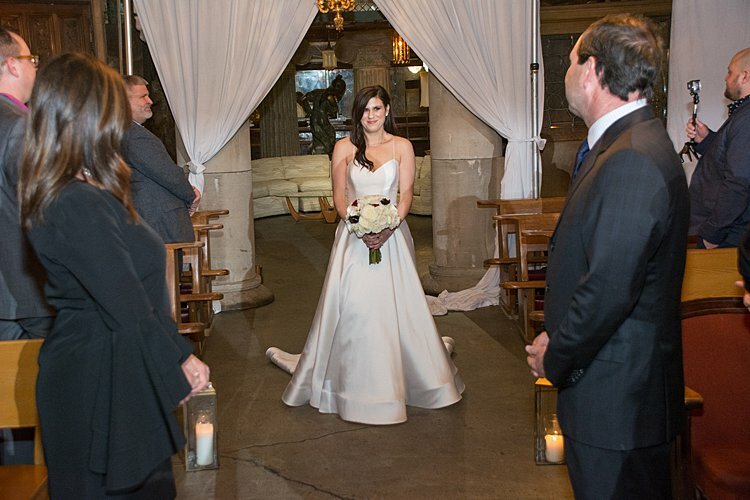 Ariel, the bride: We met at a startup incubator that both our companies were out of. The incubator hosted happy hours regularly so the companies could network with each other. George saw Ariel from across the room and made it his goal to speak to her by the end of the night, and he accomplished that goal and so much more. We have both since moved out of that incubator, but that place will always be dear to both of us. 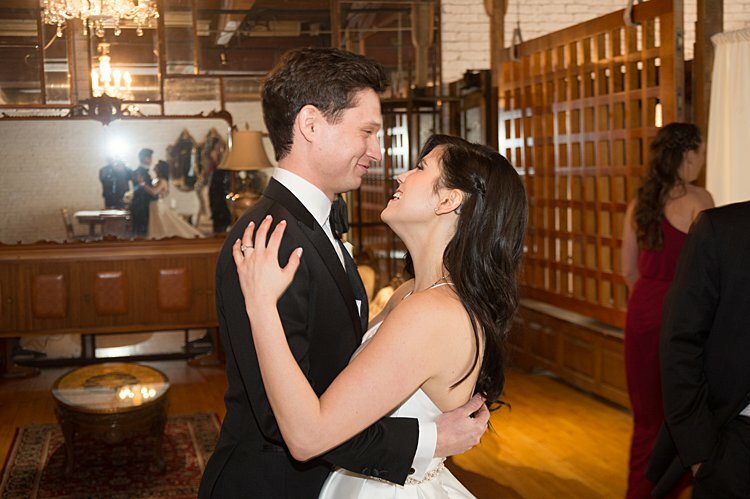 We got married at Salvage One. It’s a gorgeous space in the West Loop of Chicago. We wanted to find a spot that had built in decor. 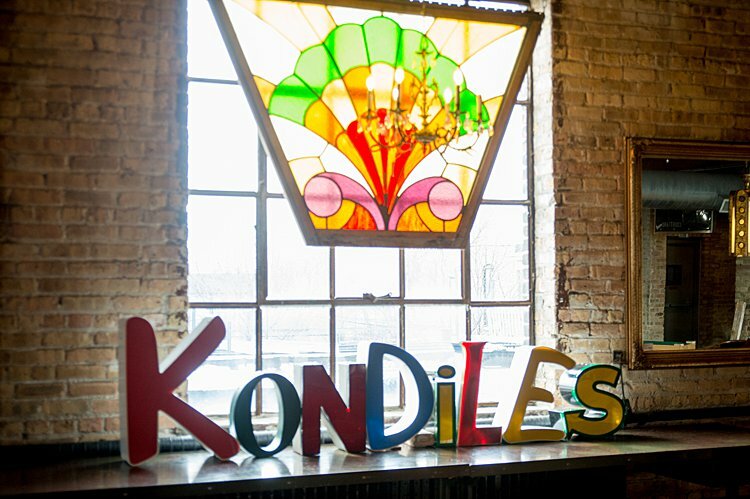 It’s an antique furniture store that has a great event space on the second floor. 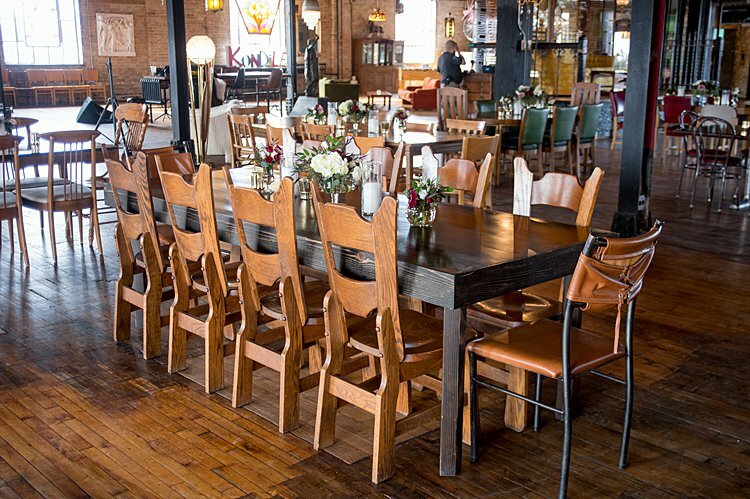 The venue provide tables and chairs that are all vintage – creating a really eclectic and gorgeous vibe. Since it was all vintage/antique ware, there was also an added warmth to the space since nothing was over the top. The cocktail hour was on the first floor, which is where the actual furniture store is so our guests got to enjoy browsing through really cool artifacts and sit on trendy couches for the past decades of style. We invited all our guests to an engagement party that turned out to be a surprise wedding. Our immediate family knew about the wedding, and a few out of towners, but our goal was to surprise as many people as possible. George and I really wanted to stay true to our style, and we didn’t want a long engagement. 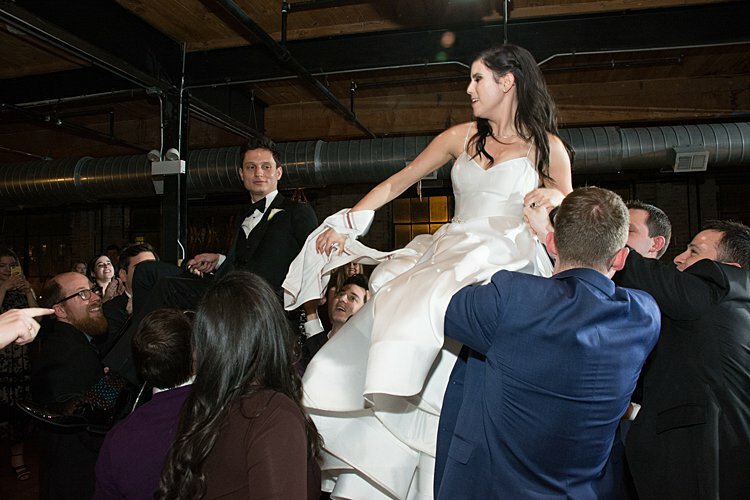 We decided to do a surprise wedding since it was unique, fun, and original. We told our parents after we had booked a venue and the initial details. The surprise was epic, no one was expecting it, the energy for the night was filled with laughter and love, which is just what we wanted. 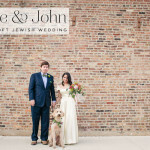 Neither of us are the typical bride and groom, we didn’t want all the hoopla that goes along with big affairs. We just wanted a special night to celebrate our love and commitment with our closest family and friends. The festivities started off as an “engagement party.” We had gotten engaged 3 months prior, so our guests weren’t surprised we were having one. We were dressed in engagement style clothing – a cute white dress for the bride and a sport coat for the groom, we snuck away an hour in, my brother-in-law made an announcement to ask our guests to sit in this area that had been closed off by pipe and drape, which was set up a ceremony – chuppah, lanterns, the whole deal. When they all got seated, George and I changed into our dress and tux, and then the processional started. There was a ton of excitement happy tears, surprise reactions, everything we’d hoped for. 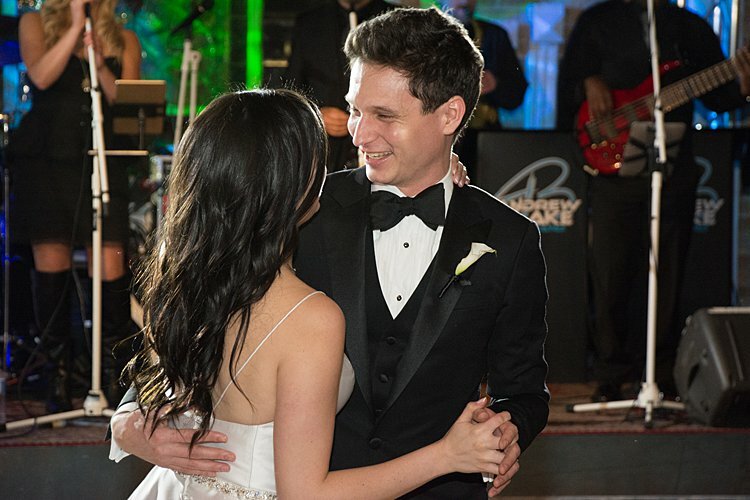 And then we got married and had a big party! We used Greenvelope‘s design for our invitation. We decided to do a paperless option for a few reasons – big weddings usually have fancy invites, we didn’t want to give our surprise away by doing something like that. Also, both George and I have soft spots for the environment. Paper invites typically end up in the trash. Greenvelope helped us not only avoid adding more trash but also donates to help save and preserve our forests. That really upholds our values – once again another way to stay true to US. 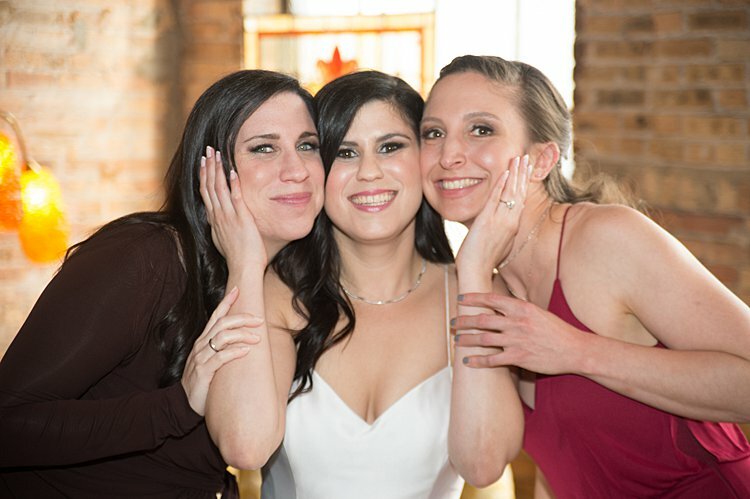 I loved both my hair stylist and makeup artist. Colby has been my stylist for years. She made me feel like a million bucks, gave me a style that made me feel like I had gorgeous hair… which isn’t something I always feel. Elise, our makeup artist, was just the sweetest. She was able to make all the girls feel special and found our colors perfectly. My dress was from Alice In Ivory. It was Rebecca Schoneveld. 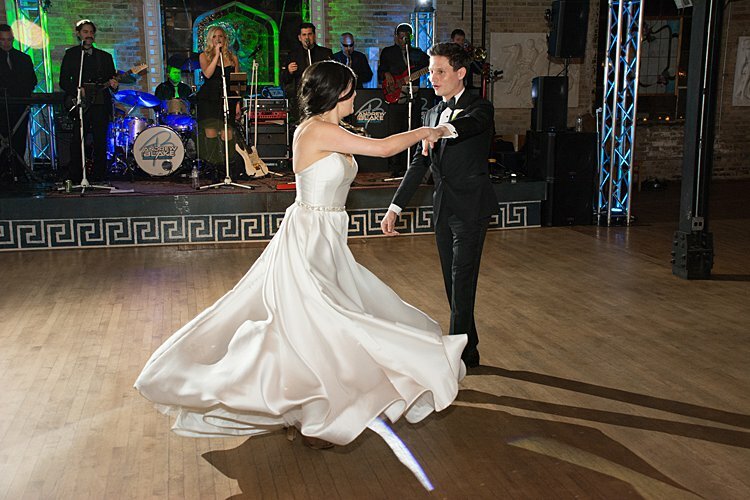 It was a classic style dress made out of cotton-silk mikado, giving it a gorgeous shine. 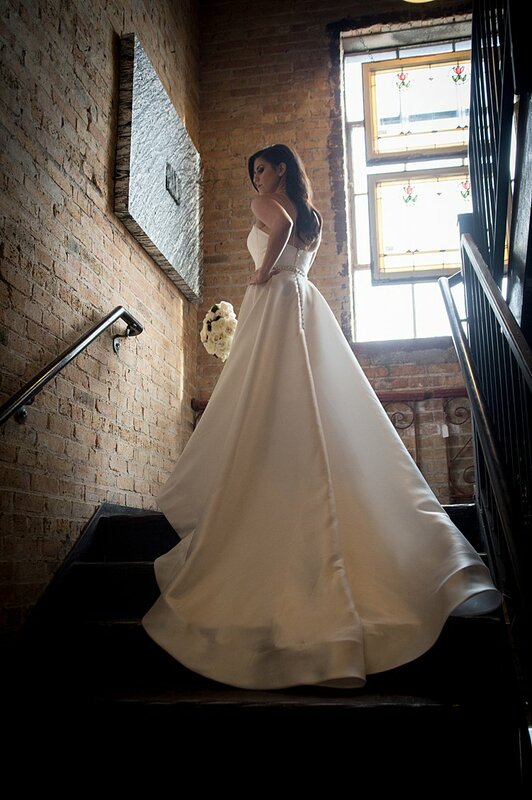 It had a gorgeous skirt that really made me feel like a bride. I had in my head an idea of a style I really wanted. I wanted a flowy skirt, with a little shine, that just made me feel ever so slightly like a princess. When I tried this dress on, it had everything I wanted – elegant, but not over the top. 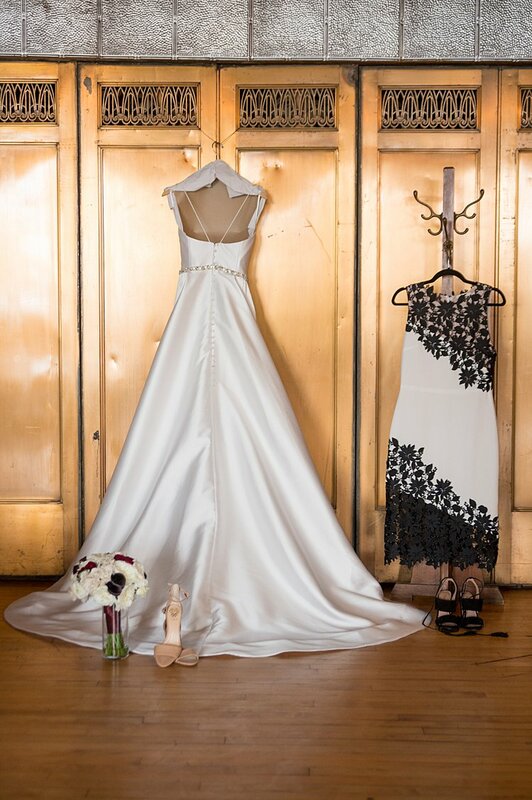 I didn’t want lace and didn’t want strapless. 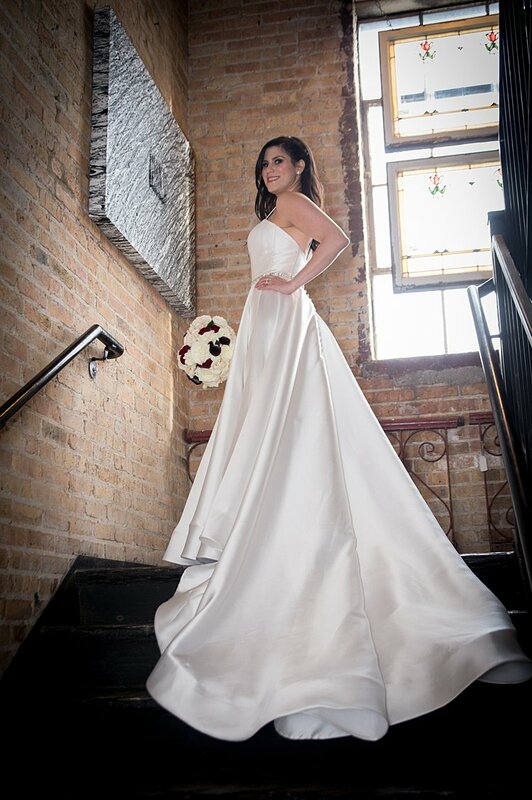 This dress made me feel truly like a bride. I’m still obsessed with it. One thing I also have to mention is that we started in cocktail attire and then did a quick change right before the ceremony. I started my night out in a gorgeous Alice and Olivia white and black dress. 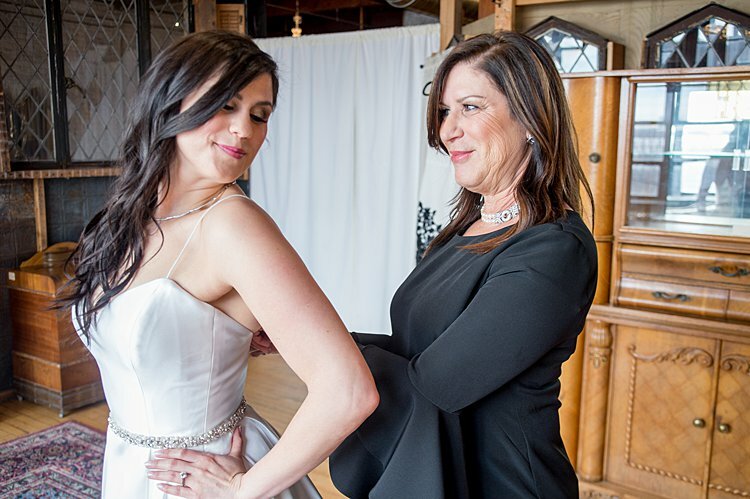 My wonderful Trunk Club stylist, Brooke Nianick, had me in and got at least 15 different dresses for me to try on. She knows my style so it was a hard pick! But we both kept coming back to this one. I didn’t do anything too special for jewelry but did borrow two items from my family. My necklace was a simple diamond necklace from my mom. I also wore something very special from my grandmother who is no longer with us. She had this beautiful pink ring that has always been so special to me. My grandmother always told me this would one day be mine, and on my wedding day, my mother gifted me with it. I wore simple Vince Camuto tan shoes, didn’t want to do anything too crazy and wanted to make sure I was comfortable all night. The groom wore a custom tux. He loves getting dressed up and any excuse to wear a tux, so our wedding was a perfect opportunity for him to do just this. I always swoon when my man dresses up, so it was extra special getting to see him looking like perfection when I walked down the aisle. For the cocktail hour, he wore a sport coat. This actually starting to give hints to our friends that this was more than a cocktail party. As I mentioned, George loves any opportunity to dress up and our friends and family love him for it. He wore dark jeans with his sport coat – which didn’t fool some of them. When they saw him more “casual” for his own engagement party, they started getting weary that something was up. Of course, the shock and awe of the surprise still got them all, but definitely started getting them thinking! We didn’t do a wedding party but we did have our sisters stand up with us. Family is the most important thing to us, and we wanted our family up there. Our sisters were able to pick out their own dresses, we wanted them to feel confident and happy in what they were wearing. My sister was pregnant, so it was extra important to me that she wore something she was happy in. All we asked was that they stay in the “burgundy” tone. It was so nice having them up there with us to say our vows and be our support along with our parents. 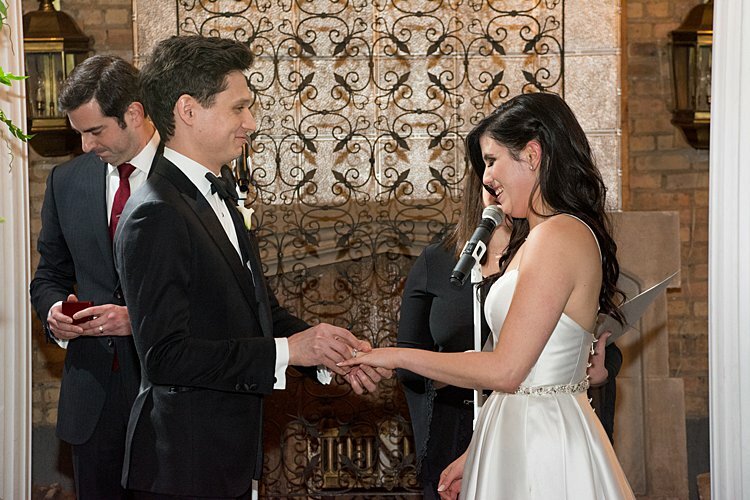 George wrote our ceremony entirely and we had two of our closest friends marry us. It was all personal touches. We had my good friend, Debi, and his good friend, Mike, marry us. Debi and I have been friends since we were 18 and George and Mike have been friends since they were 5. These two knew us very well and also had seen our relationship blossom from the start. They were extremely supportive of us and were excited to be apart of our special day and in on the secret surprise. 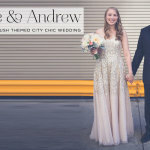 We had them over for brunch a few weeks before the wedding to talk through what we wanted with the ceremony and get advice from both of them on things that were really special to them for both their wedding ceremonies. 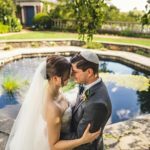 We involved a few Jewish traditions, but Judaism wasn’t our focus for the ceremony. We read the English translation of our ketubah, we chose a non-religious text, but found something that really spoke to us. 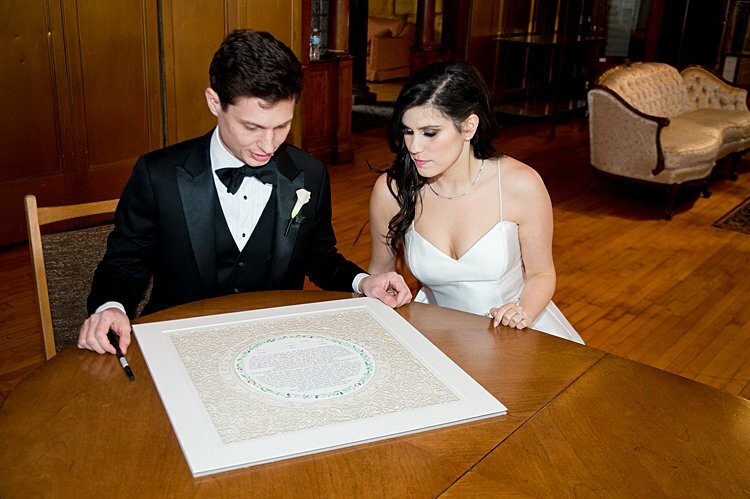 We got the ketubah off of Etsy from a designer in Israel – Noa Attias Judaica . 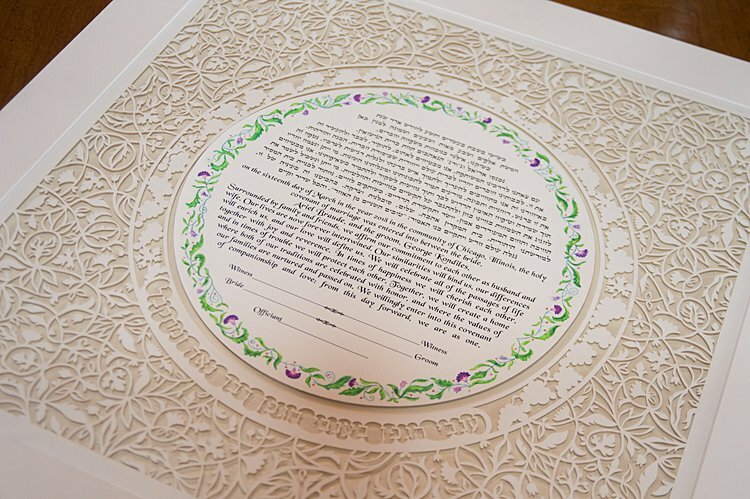 It was a gorgeous papercut ketubah that really held true to the elegant, vintage look we were going for. 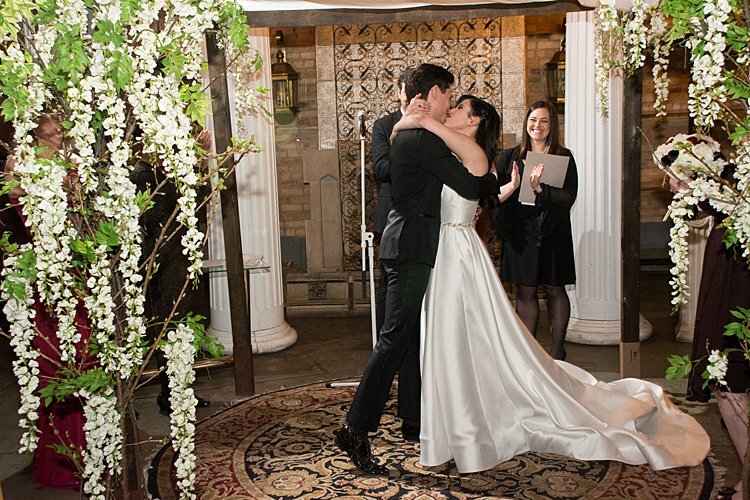 Our chuppah was extremely special for us. We made it ourselves. We bought a large piece of fabric and then sewed on special things from each of our families. 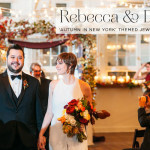 I used pieces from my mother’s wedding dress for our chuppah. George’s mom made us a special piece to also attach to the edge that had symbolic meaning to their family. 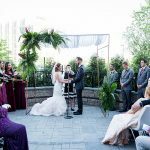 We draped it over the post provided by our florist and had it decorated with blooming branches – since we have such a love for nature. 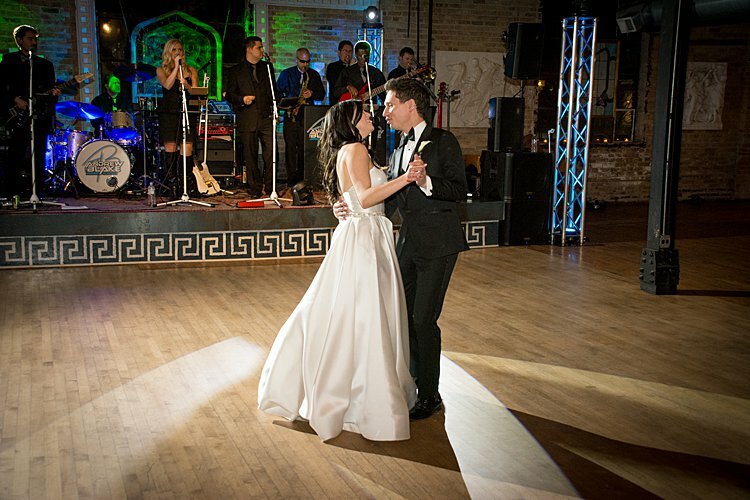 George and I really wanted a classic, timeless song to be our first dance. We chose Just The Way You Look Tonight by Frank Sinatra. That song has already stood the test of time. 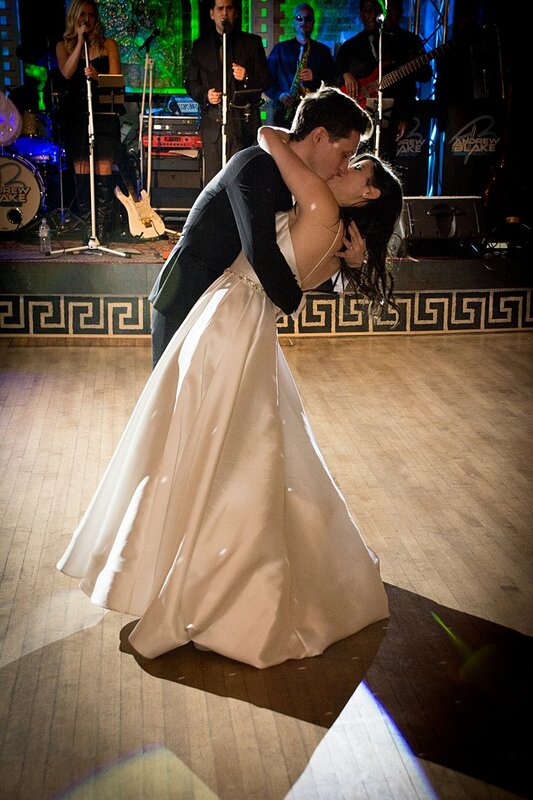 We want our marriage to stand the test of time, and its such a beautiful love song. We had a live band, which was very important to George. It was the best decision! We had a 9 piece band, with a horn section and everything. 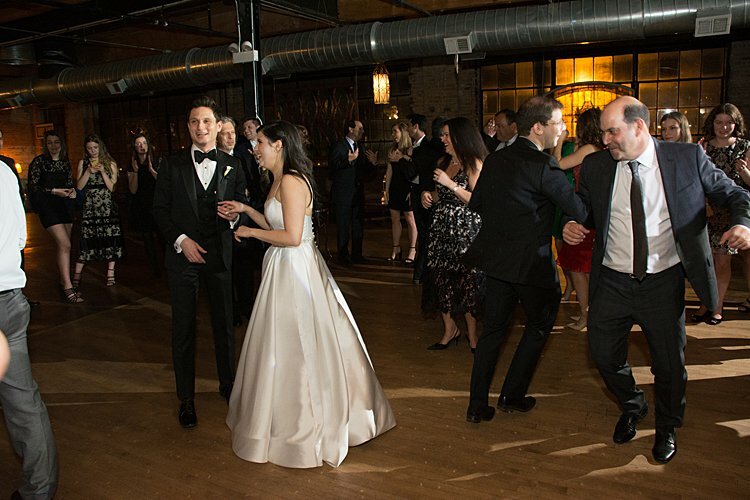 They kept the dance floor bumping throughout the entire evening and really created a special feel for the party. Cala lilies are my favorite flower, so that was the accent flower for my bouquet. I really wanted a classic, elegant style. 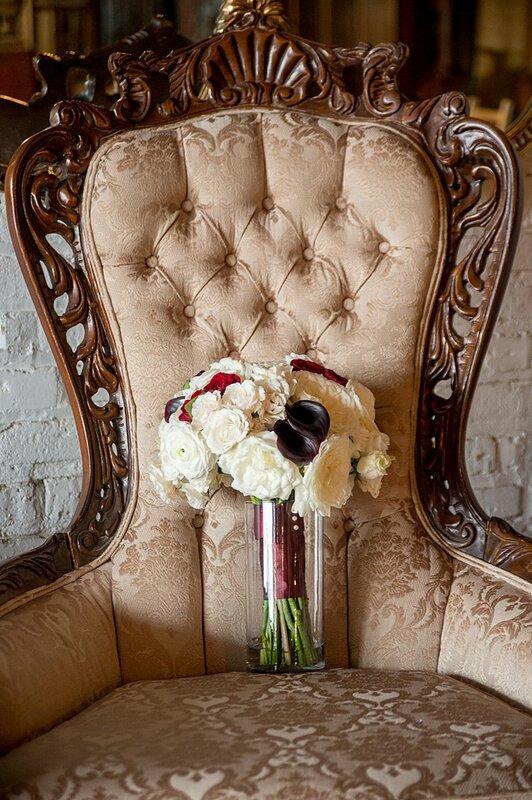 I chose to keep the flower arrangement simple with just white flowers and a pop of burgundy cala lilies. The table center pieces we kept very simple since the space had so much character already. We didn’t want our decor to overpower the unique, antique look of the space. 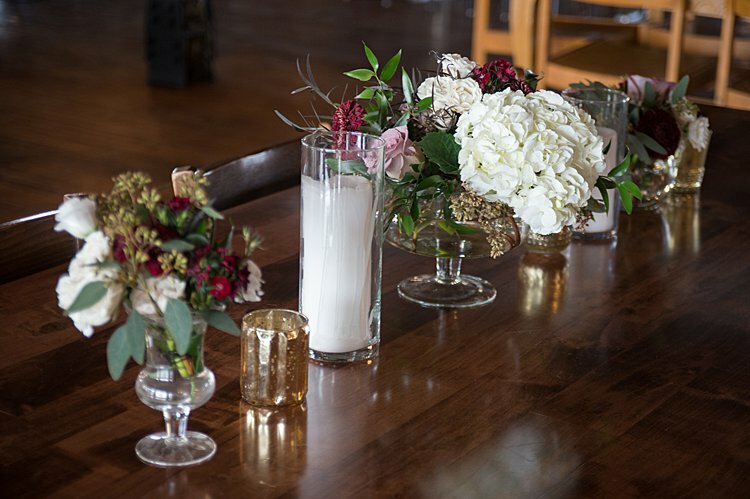 We kept our flower arrangements small and low, but they added just a bit of classiness to the table. 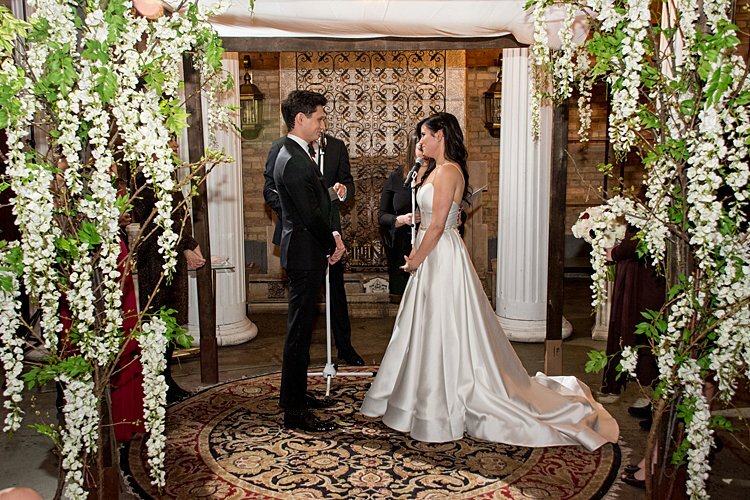 Bill Shayaka with Eivan Photography captured our special day. We spoke a few times on the phone, so he understood the surprise and excitement of the night. He really did a great job of capturing the night. Our wedding style was inspired by who we are as a couple. 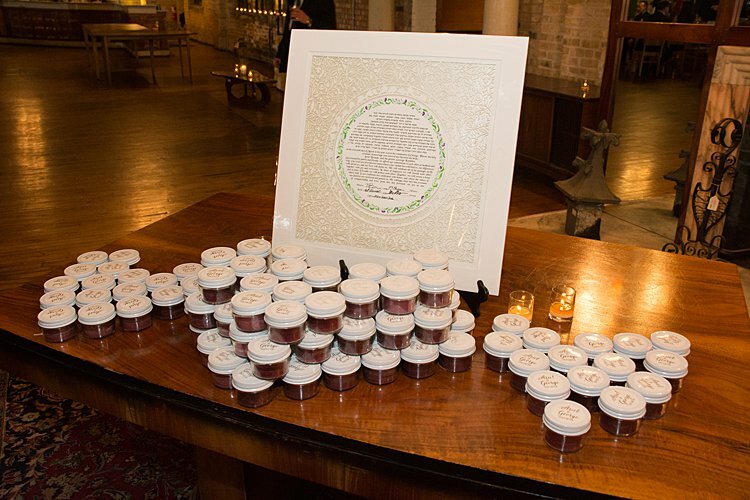 We enjoy small, intimate gatherings – so we worked really hard to keep our guest list under 100. 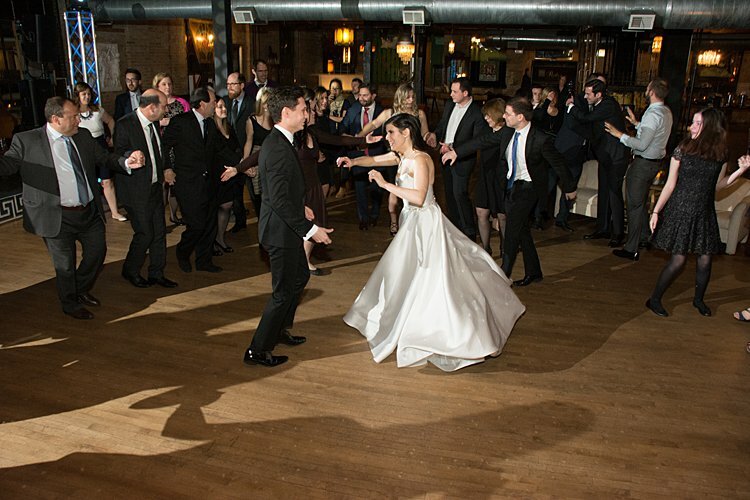 We like to be unique and don’t like too much fussyness – hence the surprise wedding. 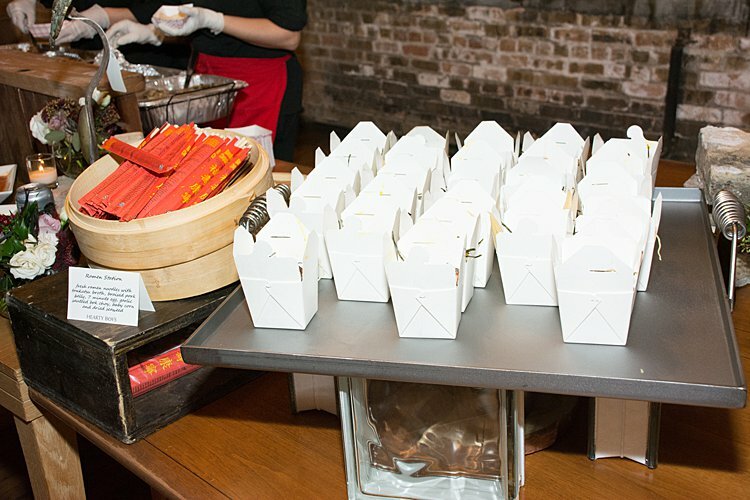 We love food – hence the food stations (taco station, ramen station, slider staion, and mac and cheese), all our favorite and plenty of it. 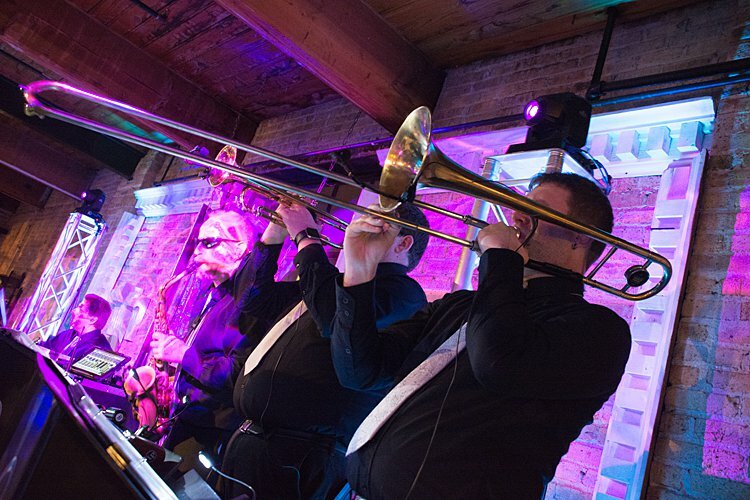 We love music – hence the big band. 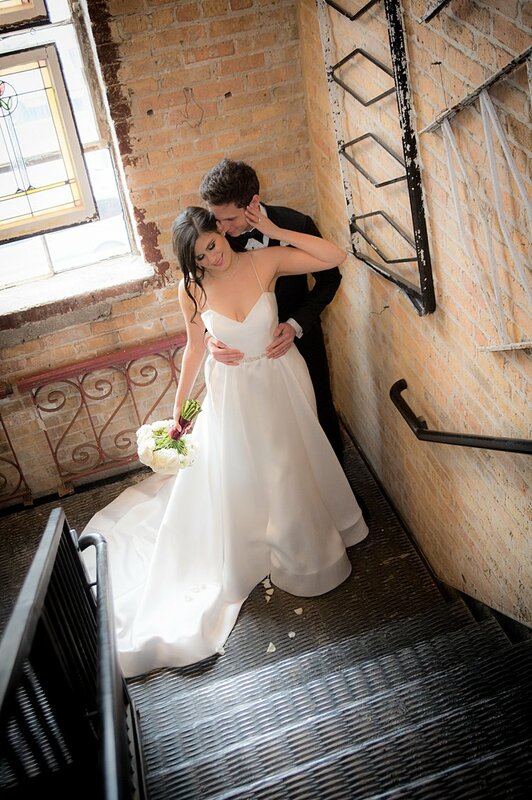 And most of all, we love each other – so the entire planning experience stayed true to our commitment to each other. We made sure that both our opinions and voices were heard, and that we planned a wedding that meant something special to us. Our caterer won our hearts over with their cake balls, so we decided against a cake. 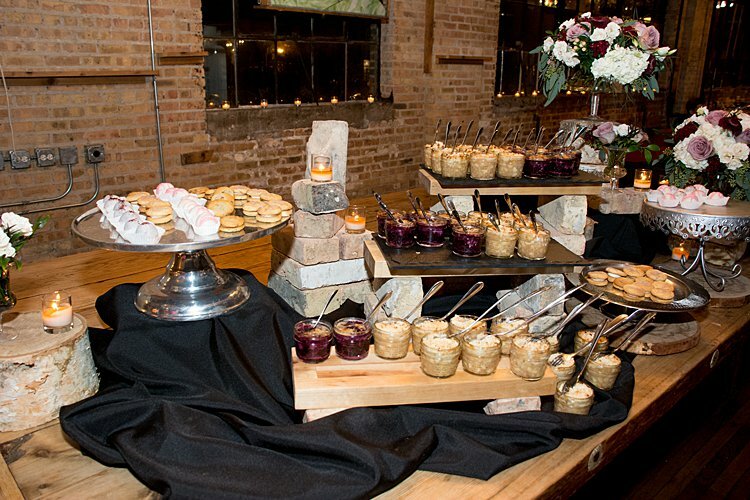 We had a dessert bar that included mini pies, cake balls, and mini cookie sandwiches. Everything was insanely delicious and the cake balls were definitely the winner of the night. I had a wonderful coworker of mine, who is a candle maker, make mini candles for all our guests. I was able to select a delicious scent with her and select the colors for the night. They were peronalized with a little stickers I printed off with our name on it. We didn’t want to do anything over the top, just something small and personal that people could take home, light it up, and remember the night by smelling the delicious candle smell. We went to France! George and I both love French food and wine. We toured the French wine county and ended our trip in Champagne! It was amazing. Everything was so romantic and so much of who we are as a couple came through on that trip. 1. Stay true to what YOU want. So many people get distracted and swayed by what everyone else wants you to do. Plan things out between the bride and groom, make sure you’re a united team and agree together, and then bring others in. 2. Not all decisions need to be made all at once. 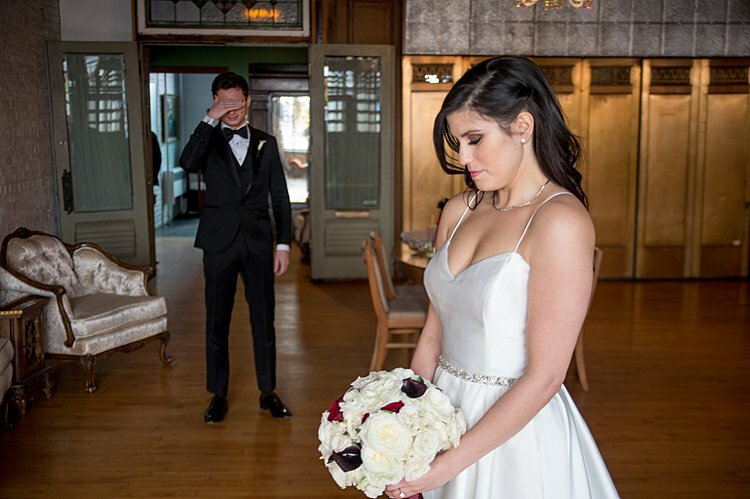 Take your time, once you get your date and venue booked, step out the rest so you are not overwhelmed. I am an over-obsessive planner, but my husband is not. I would come home after work and ask him tons of questions, that stressed him out. We adjusted our planning style to discussing only one topic a night, instead of tons at once. Great learning experience for a couple as well to be able to read each other and find the best ways to work together.